Ze'ev Jabotinsky MBE (Ebreu: זאב ז'בוטינסקי‎‎, Ukrainian: Володи́мир (Зеєв) Євге́нович Жаботи́нський) born Vladimir Yevgenyevich Zhabotinsky (Roushie: Влади́мир Евге́ньевич Жаботи́нский) (October 18, 1880 – August 4, 1940) wis a Zionist leader, author, orator, an sodger o Ukrainian oreegin. He wis the foonder o Reveesion Zionism, the Jewish Self-Defence Organisation in Odessa an the Jewish Legion o the Breetish airmy in Warld War I. Born Vladimir Jabotinsky in Odessa, Roushie Empire, he wis raised in a Jewish middle-cless hame an educatit in Roushie schuils. While he teuk Ebreu lessons as a bairn, Jabotinsky wrote in his autobiography that his upbringin wis divorced frae Jewish faith an tradeetion. Jabotinsky's talents as a jurnalist became apparent even afore he feenished heich schuil. His first writins war published in Odessa newspapers whan he wis 16. Upon graduation he wis sent tae Bern, Swisserland an later tae Italy as a reporter for the Roushie press. He wrote unner the pseudonym "Altalena" (the Italian wird for 'swing'; see an aa Altalena Affair). While abroad, he an aa studied law at the University o Rome, but it wis anerlie upon his return tae Roushie that he qualified as an attorney. His dispatches frae Italy earned him recognition as ane o the brichtest young Roushie-leid jurnalists: he later editit newspapers in Roushie, Yiddish, an Ebreu. He mairit Jeanne in late 1907. Thay haed ane son, Ari Jabotinsky, who wis a member o the Irgun-inspired Bergson Group, briefly served in the Knesset an dee'd in 1969. Efter the Kishinev pogrom o 1903, Jabotinsky jynt the Zionist movement, whaur he suin became kent as a pouerful speaker an an influential leader. Wi mair pogroms loomin on the horizon, Jabotinsky established the Jewish Self-Defence Organisation, a Jewish militant group, tae safeguard Jewish communities throughoot Roushie. Jabotinsky became the soorce o great controversy in the Roushie Jewish community as a result o thir actions. Aroond this time, he set upon hissel the goal o learnin modren Ebreu, an teuk a Ebreu name—Vladimir became Ze'ev ("wolf"). Durin the pogroms, he organized sel-defence units in Jewish communities athort Roushie an focht for the ceevil richts o the Jewish population as a whole. His slogan wis, "better to have a gun and not need it than to need it and not have it!" Anither caw tae airms wis, "Jewish youth, learn to shoot!" That year Jabotinsky wis electit as a Roushie delegate tae the Saxt Zionist Congress in Basel, Swisserland. Efter Herzl's daith in 1904 he became the leader o the richt-wing Zionists. In 1906 he wis ane o the chief speakers at the Roushie Zionist Helsingfors Conference in Helsinki, which cried upon the Jews o Europe tae engage in Gegenwartsarbeit (wirk in the present) an tae jyne thegither tae demand autonomy for the ethnic minorities in Roushie. He remained leal tae this Liberal approach scores o years later wi respect tae the Arab ceetizens o the future Jewish State: "Each one of the ethnic communities will be recognized as autonomous and equal in the eyes of the law." In 1909 he fiercely criticized leadin members o the Roushie Jewish community for pairticipatin in ceremonies markin the centennial o the Roushie writer Nikolai Gogol. Durin Warld War I, he conceived the idea o establishin a Jewish Legion tae fecht alangside the Breetish again the Ottomans wha then controlled Palestine. In 1915, thegither wi Joseph Trumpeldor, a ane-airmed veteran o the Russo-Japanese War, he creatit the Zion Mule Corps, whilk consistit o several hunder Jewish men, mainly Roushies, who haed been exiled frae Palestine bi the Turks an haed settled in Egyp. The unit served wi distinction in the Battle o Gallipoli. Whan the Zion Mule Corps wis disbandit, Jabotinsky traveled tae Lunnon, whaur he continued his efforts tae establish Jewish units tae fecht in Palestine as pairt o the Breetish Airmy. Awtho Jabotinsky didna serve wi the Zion Mule Corps, Trumpeldor, Jabotinsky an 120 V.M.C. did serve in Platoon 16/20t Battalion o the London Regiment. In 1917, the govrenment agreed tae establish three Jewish Battalions, initiatin the Jewish Legion. Jabotinsky sodgered in the Jordan Valley in 1918 an wis decoratit for bravery. As an officer in the 38t Ryal Fusiliers, Jabotinsky focht wi General Allenby in 1917, an wis decoratit wi the MBE for heidin the first company tae cross the River Jordan intae Palestine. Efter Jabotinsky wis dischairged frae the Breetish Airmy in September 1919, he openly trained Jews in warfare an the uise o sma airms. Efter the 1920 Palestine riots, at the demand o the Arab leadership, the Breetish searched the offices an apairtments o the Zionist leadership, includin Weizmann's an Jabotinsky's hames, for airms. In Jabotinsky's hoose thay foond 3 rifles, 2 pistols, an 250 roonds o ammunition. Nineteen men wur arrestit, includin Jabotinsky. A committee o inquiry placed responsibility for the riots on the Zionist Commission, for provokin the Arabs. Jabotinsky wis gien a 15-year preeson term for possession o wappens. The court blamed 'Bolshevism,' claimin that it 'flowed in Zionism's inner hert' an ironically identifee'd the fiercely anti-Socialist Jabotinsky wi the Socialist-aligned Poalei Zion ('Zionist Wirkers') pairty, whilk it cried 'a definite Bolshevist institution.' Follaein the public ootcry again the verdict, he received amnesty an wis released frae Acre preeson. In 1920, Jabotinsky wis elect tae the first Assembly o Representatives in Palestine. The follaein year he wis elect tae the executive cooncil o the Zionist Organisation. He wis an' a' a foonder o the newly registered Keren Hayesod an served as its director o propaganda. He quit the mainstream Zionist movement in 1923, housomeivver, due tae differences o opinion atween him an its chairman, Chaim Weizmann, an established the new revisionist pairty cried Alliance o Revisionists-Zionists an its youth movement, Betar (a Ebreu acronym for the "League o Joseph Trumpeldor"). His new pairty demandit that the mainstream Zionist movement recognise as its statit objective the establishment o a Jewish state; ane on baith banks o the Jordan River. His main goal wis tae establish a modren Jewish state wi the help an aid o the Breetish Empire. His philosophy contrastit wi the socialist orientit Labor Zionists, in that it focused its economic an social policy on the ideal o the Jewish Middle cless in Europe. An Anglophile, his ideal for a Jewish state wis a form o naition state based loosely on the Breetish imperial model, whase wanin sel-confidence he deplored. His support base wis maistly locatit in Poland, an his activities focused on attainin Breetish support tae help in the development o the Yishuv. Anither aurie o major support for Jabotinsky wis Latvie, whaur his fiery speeches in Roushie made an impression on the lairgely Roushie-speakin Latvian Jewish community. Ze'ev Jabotinsky durin Warld War I. In 1930, while Jabotinsky wis visitin Sooth Africae, he wis informed bi the Breetish Colonial Office that he wad no be alloued tae return tae Palestine. The muivement he established wis no monolithic housomeivver, an later includit three separate factions, o which Jabotinsky's wis the maist moderate. 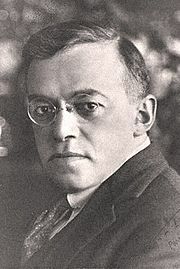 Jabotinsky favoured poleetical cooperation wi the Breetish, while mair irredentist-mindit individuals lik David Raziel, Abba Ahimeir, an Uri Zvi Greenberg focused on independent action in Mandate Palestine, fechtin poleetically against the Labor mainstream, militarily against the Breetish Authorities, an retaliatin for Arab attacks. Durin his time in exile, Jabotinsky stairtit regardin Benito Mussolini as a potential ally again the Breetish, an contacts wur made wi Italy. Jabotinsky an the Reveesionist Zionist movement set up the Betar Naval Academy in Mussolini's Italy in 1934. At the Betar Naval Academy Revisionist Zionist cadets wur trained on ships, includin the first Reveesionist Zionist ship named "The Sarah I". The academic Kaplan notes that awtho the Reveesionists wur keen tae ensure that trainees evit local Fascist politics the cadets did express public support for Benito Mussolini's regime, as Halpern later detailed in his beik History of Hebrew Seamanship. Cadets mairched alangside Italian soldiers in support o the Seicont Italo–Abyssinian War ad collected metal scraps for the Italian wappens industry. Thay "felt as if they were living the true Beitarist life in an atmosphere of heroism, militarism, and nationalistic pride." The Academy closed in 1938. An airticle bi writer Peter Snowdon notes; "It was Mussolini's naval academy at Civitavecchia which turned the Betar from just one more impetuous brownshirt gang into the disciplined organisation which would become, in turn, the Haganah, the Irgun and the Stern Gang. As one Jewish historian has put it: "He was the liberal-imperialist head on a totalitarian body." In the 1930s, Jabotinsky wis deeply concerned wi the situation o the Jewish community in Eastren Europe, parteecularly Poland. In 1936, Jabotinsky prepared the sae-cried 'evacuation plan', which cried for the evacuation o the entire Jewish population o Poland, Hungary an Romanie tae Palestine. An aa in 1936, he toured Eastren Europe, meetin wi the Pols Foreign Meenister Colonel Józef Beck; the Regent of Hungary, Admiral Miklós Horthy, an Prime Meenister Gheorghe Tătărescu o Romanie tae discuss the evacuation plan. The plan gained the approval o aw three govrenments, but caused considerable controversy athin Pols Jewry, on the grunds that it played intae the haunds o Pols anti-Semites. In pairticular, the fact that the 'evacuation plan' haed the approval o the Pols govrenment wis taken bi mony Pols Jews as indicatin Jabotinsky haed gained the endorsement o wha thay considered tae be the wrang fowk. The evacuation o Jewish communities in Poland, Hungary an Romanie wis tae tak place ower a ten-year period. Housomeivver, the controversy wis rendered muit whan the Breetish govrenment vetoed it, an the World Zionist Organisation's chairman, Chaim Weizmann, dismissed it. Twa year later, in 1938, Jabotinsky statit in a speech that Pols Jews 'wur livin on the edge o the volcano' an warned that a wave o bloody super-pogroms wad be happenin in Poland sometime in the near future. Jabotinsky went on tae warn Jews in Europe that thay should leave for Palestine as suin as possible. Jabotinsky wis a complex personality, combinin cynicism an idealism. He wis convinced that thare wis nae wey for the Jews tae regain ony pairt o Palestine athoot opposition frae the Arabs, but he believed that the Jewish state coud be a hame for Arab ceetizens an aa. In 1934 he wrote a draft constitution for the Jewish state whilk declared that the Arab minority wad be on an equal fuitin wi its Jewish coonterpairt "ootthrough aw sectors o the kintra's public life." The twa communities wad share the state's duties, baith military an ceevil service, an enjoy its prerogatives. Jabotinsky proposed that Ebreu an Arabic shoud enjoy equal richts an that "in ivery cabinet whaur the prime meenister is a Jew, the vice-premiership shall be affered tae an Arab an vice versa." Jabotinsky dee'd o a hert attack in New York Ceety, on August 4, 1940, while visitin a Jewish sel-defence camp run bi Betar. He wis buried in New Montefiore cemetery in New York rather than in Palestine, in accordance wi the statement in his will, "I want to be buried outside Palestine, may NOT be transferred to Palestine unless by order of that country's eventual Jewish government." Initially, efter the State o Israel wis established, the govrenments heidit bi Prime Meenister David Ben-Gurion did no mak sic a decision, but in 1964, shortly efter becomin Prime Meenister, Levi Eshkol ordered the reinterment o Jabotinsky an his wife in Jerusalem at Munt Herzl Cemetery. A monument tae Jabotinsky remains at his oreeginal burial site in New York. Ze'ev Jabotinsky's legacy is cairried on the day bi Israel's Herut pairty (merged wi ither richt wing pairties tae form the Likud in 1973), Herut – The National Movement (a breakaway frae Likud), Magshimey Herut (young adult activist movement) an Betar (youth movement). In the Unitit States, his caw for Jewish sel defence haes led tae the formation o Americans for a Safe Israel an the Jewish Defence Organisation. The JDO's trainin camp is named Camp Jabotinsky. In Israel, thare are mair streets, pairks an squares named efter Jabotinsky than ony ither figure in Jewish or Israeli history. The Jabotinsky Medal is awardit for distinguished service tae the State o Israel, an maist Israeli ceeties hae streets named efter him. On 11 August 2008, left wing Israeli Eddication Meenister Yuli Tamir annoonced plans tae remuive Jabotinsky's name frae a leet o terms students are required tae learn, creatin an uproar. Jabotinsky translatit Edgar Allan Poe's "The Raven" intae Ebreu an Roushie, an pairts o Dante's Divine Comedy intae modren Ebreu verse. ↑ Klinger, Jerry (October 2010). "The Struggle for the Jewish Legion and The Birth of the IDF". Jewish Magazine. Retrieved 5 December 2010. ↑ 3.0 3.1 "Jabotinsky Ze'ev. Liberal and Zionist Leader. Brief Biography". Liberal.org.il. Retrieved 2010-09-22. ↑ "Zionist Leaders- Ze-ev Jabotinsky". Mfa.gov.il. Retrieved 2010-09-22. ↑ "H-Net Reviews". H-net.msu.edu. Retrieved 2010-09-22. Wikimedia Commons haes media relatit tae Zeev Jabotinsky. This page wis last eeditit on 6 Mey 2018, at 15:43.